If you'd like to know more, please feel free to call us at 404.847.9585 in the Atlanta area or toll-free at 1.844.9.NSIGHT (844.967.4448), click here to use our web form, or send us an email with your request. This company needed a way to track performance of its sales force by individual and location, as well as to track historical sales trends for itself as well as for competitors. They also wanted users to be able to log in and just their own accounts while those of other users were hidden. 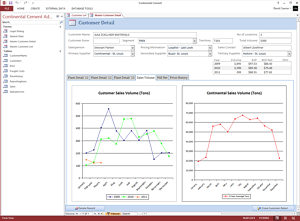 The Microsoft Access database that we created did just that, providing an easy to view summary by client, location, and company-wide using a variety of performance metrics. This company -- the largest auditor of credit unions in the U.S. -- needed a better way to track new business opportunities. 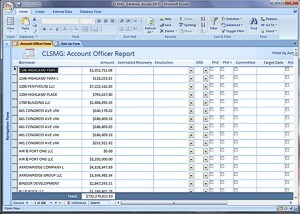 A long-time user of ACT!, we convinced the company that Microsoft Access would provide a more robust solution as well a better way to work with data for users logging in from remote locations. We converted all the data from ACT! 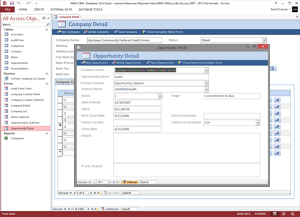 and used it to populate the Access database we created, and the company began using their newly-created solution in less than two weeks. Our client was seeking a better way to manage its employee benefits packages across multiple states using various providers. Our solution was an Access database that tracks each employee, their dependents, the coverages they elect, their pay periods, and the costs for the company and the employee both on an annual and pay period basis. 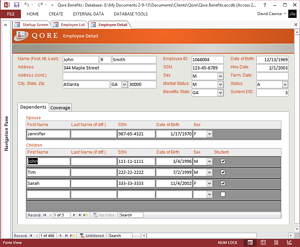 The database also tracks new employees' coverage start dates along with employees who leave and elect COBRA, along with their payment requirements and coverage periods. The database provides detailed reports by employee to assist plan administrators in reconciliation of invoices from providers. 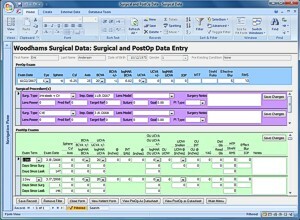 This database was created for a laser eye surgery practice to enable it to track each patient's pre-surgical characteristics, the surgeries performed, and the post-surgical results measured at various intervals after the surgery. Its purpose was twofold -- to allow the practice to evaluate its results and use the data to improve care for its patients, and to facilitate participation in clinical trials for various lenses. 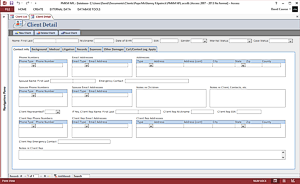 This was one of several databases we created for this client; others included operating room efficiency, patient satisfaction, and patient billing. Our client was seeking a way to manage information being collected from plaintiffs in prominent class action lawsuits for which is was acting as counsel (NFL Players Concussion, DePuy Pinnacle Hip Replacement, etc.). We created an Access database that allowed the collection of detailed information on each plaintiff, including demographic information, medical symptoms and treatment histories including detailed costs and expenses, etc. This database was created to enable a bank to track collection efforts and outcomes for a $700 million distressed commercial loan portfolio it purchased from the FDIC. As part of the purchase agreement, the bank assumed responsibility for managing the workout process while receiving support from the FDIC in terms of a backstop to cover credit losses. The ability to assess and document potential and actual recoveries is critical to the bank's ability to collect on any claims it submits to the FDIC.